We're going on a frog hunt…. 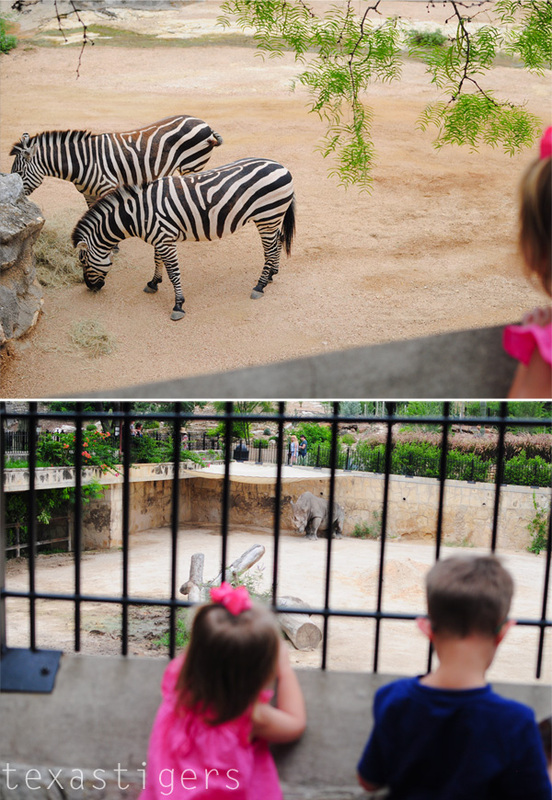 Last week the San Antonio Zoo invited us to visit for the first time in about a year. 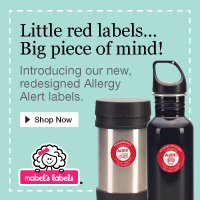 We hadn't renewed our season past last year since with preschool and Abby in school now and I felt a little bad if I just took Lexie all the time, or that Abby would miss out since we rarely went on weekends. 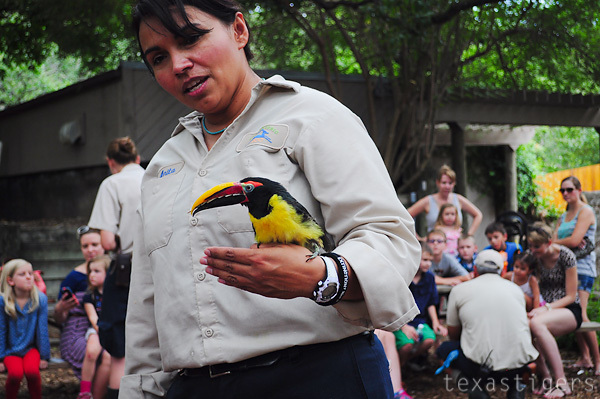 The zoo invited us to come and check out the animals and also to learn from some of their keepers in honor of National Zoo Keeper Appreciation Week. 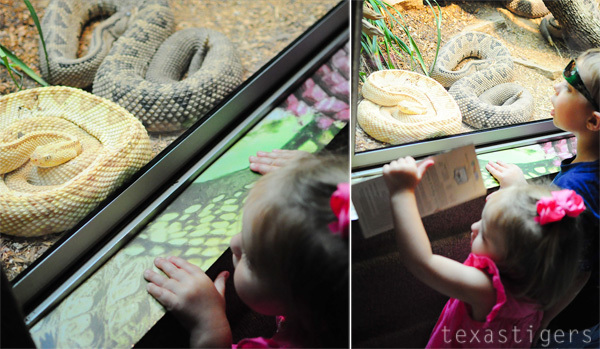 The first thing Micah wanted to see was the snake house. 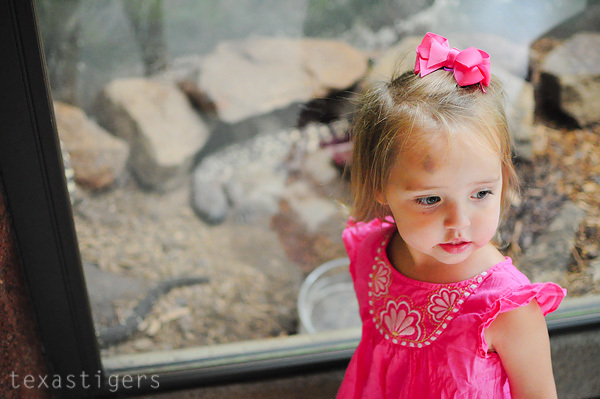 Seriously - what's up with my kids and reptiles? First Abby's obsession with alligators, then frog hunts, now the snake house. Reptiles or not I'll take the air conditioning. I love how many of the widows were low enough that I didn't have to lift both kids to see into each exhibit. Next Micah wanted to see the cheetah but to get there we would pass a lot of animals so we took our time through Africa Live to get to the cheetahs. Of course we would find the giant frog on our way. 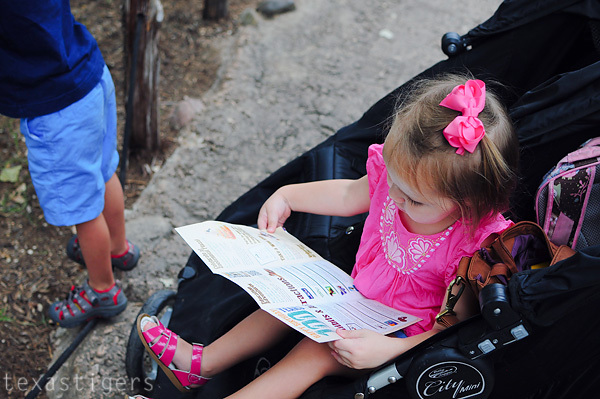 Lexie wanted to have a say on where we went as well and loved looking at the map with colorful animal pictures. Even if she did keep calling the tiger a cheetah. She ought to know better! Pass the monkeys in Africa live where we were able to see a baby monkey being quite playful, the elephant and then we made it to the cheetahs. They were smart though hanging out in the shade in some bushes so they were hard to spot. We did catch one of the tigers snoozing in the stairwell. The zebras were out eating lunch and the rhino looked like he was about to take a nap. I'm grateful for the new added bars on the rhino exhibit - I always felt like that wall was low for little ones! 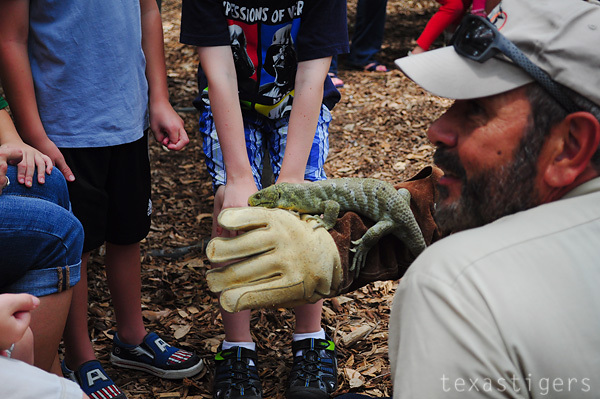 Then we met up with some of our blogger friends and the keepers brought out some of the animals to show us. We learned about Pierre the Possum. This little just turned one year old guy is fed a diet of dog food and banana biscuits. Possums also have the most teeth of any mammal. He was a lot more active than a normal possum would have been during the day since he's been raised that way but most are nocturnal. A bird in the Tucan family. I can't remember his name because it was at this point that Lexie realized she was starving and needed everyone to know she needed a snack. 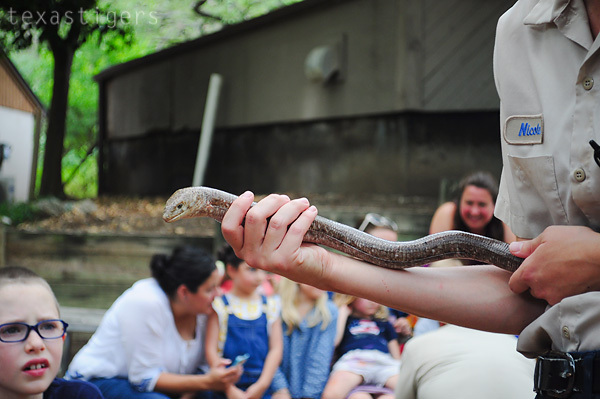 Ivan the legless lizard - not a snake. Still a reptile. And King the Skink - he's got a prehensile tail. 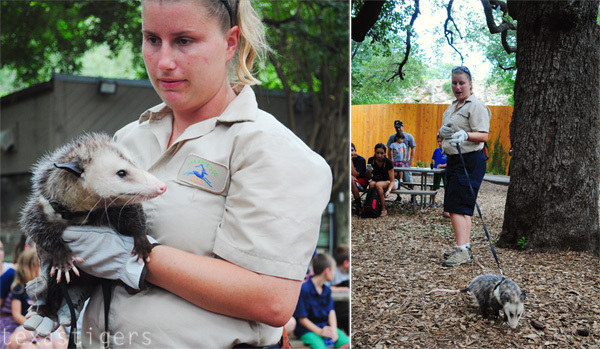 All the littles seemed to enjoy learning about these animals up close and finding out more about what the zoo keepers do at the zoo. To finish off our afternoon at the zoo (before we dissolved in a puddle of sweat from the heat!) 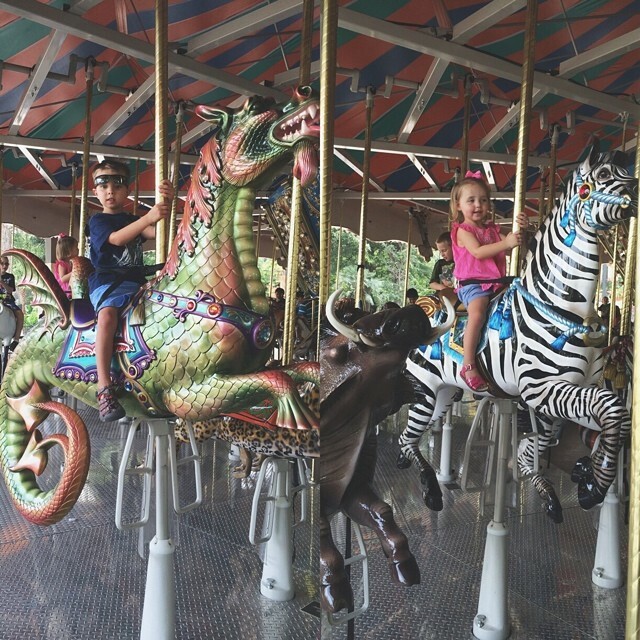 we took a ride on the newly completed carousel. Micah *had* to ride on the dragon or I think despite all the other great things we saw he would have been totally bummed - luckily it wasn't too crowded and we waited one extra turn until we were at the beginning of the line. Lexie was super excited to pick out a zebra to ride on. The carousel is really beautiful with loads of different animals to pick from to ride on. Thank you SA Zoo for a great day learning about the animals and the great zoo keepers that take care of them. *disclosure: We recieved free admission to the zoo for the day to enjoy the grounds and meet the keepers. I love to go to the zoo! Baby boy really likes the fish. One time we went, he just turned one when he saw the Cheetahs. I was trying to take him away, but he kept yelling "Kitty! Kitty!". That legless reptile looks really cool!